Today’s edition of “Split-Second Story” comes to you from Oxford, England, where self spent the day on the grounds of Christ Church, one of Oxford’s largest colleges, founded by King Henry VIII in 1532 (Self watched a 15-minute video at the Visitor Center). The chapel is Norman, built in the 11th century. Saint Frideswide, “England’s first saint,” became renowned for her chastity by rejecting the advances of an amorous king. Since the king was absolutely relentless, Frideswide took refuge in the woods of Oxfordshire, and became the center of a cult of devotees which included Catherine of Aragon. 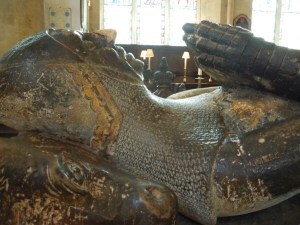 A knight in full armor lies in state in Christ Church Chapel, Oxford. 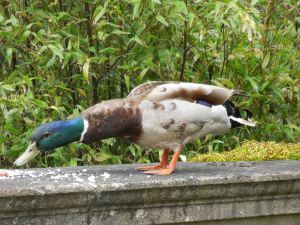 Self saw ducks feeding on bread crumbs left by visitors.